Today’s internet is far more advanced than it used to be, thanks to technological advances and many, many updates to devices, servers and resources. Whilst most of us have evolved with the times to stay on top of the industry, some marketers who write for search engine optimisation (SEO), use practices and techniques from donkey’s years ago! To help you understand more about the do’s and don’t’s of producing content for your website, we’ve put together a very brief history of ‘writing for SEO’ and what it means. Going back to where it started. There is a lot of questioning as to whether SEO started with the launch of the first website published in 1991, but there is a claim that the term SEO was created by James Gambert and that he was the first to perform this tactic. In 2008, he tried to trademark the term SEO as his own, by saying he helped a band appear at the top of the search results by stuffing black text keywords onto a black background. To find out more on his story on creating SEO, read more about it here. Marketers would cram as many keywords as they could into meta/HTML tags and page content, in order to rank high in search engines for specific searches. Greater keyword volume helped improve search engine results, but it wasn’t great for user experience! Every keyword would practically be the same, for example; pink purse, pink purses, pink purse accessory, pink purse accessories, pink purses accessory, pink purses accessories, and so on . Search engines weren’t advanced enough to figure out that all these keywords basically had the same intent and produced the same thing. Search engine results could also be affected by saturating domains and URLs with keywords, for example – “pink-purse-accessories.pinkpurseaccessories.info”. Ridiculous, right? To try and trick search engines into giving a page a higher ranking, differing pieces of content were served up depending on the page viewer. When a search robot visited the page it would be shown keyword focused content, whilst a human user would be given a more coherent, readable version featuring fewer keywords. Search engines have, of course, outlawed this technique due to spammy, keyword filled pages with no relevant content appearing high up in their rankings. Search engines would give a higher position to pages which included an exact match with a user’s search term. In order to cover the numerous search terms that might be typed into a search engine, varying versions of a single web page would be created, each focusing on a different keyword or phrase. Think about all the pages that were created! Although search engines still took domain and URL keywords into consideration, they weren’t completely relied upon and didn’t give so much weight to improving a websites ranking. Keywords were still being added to meta/HTML tags and content, but search engines were starting to become wise to keyword stuffing and optimisers began to realise that it didn’t make for a great user experience. Location keywords and personalisation including search history and interests were also added to SEO tactics. Slowly, marketers realised that the quality of their content was becoming more important. When a user types a certain phrase into a search engine, it means they’re hunting for further information on this subject. Your page content needs to be able to provide information that’s relevant to this search query – basically, produce content that will help a user answer their questions. 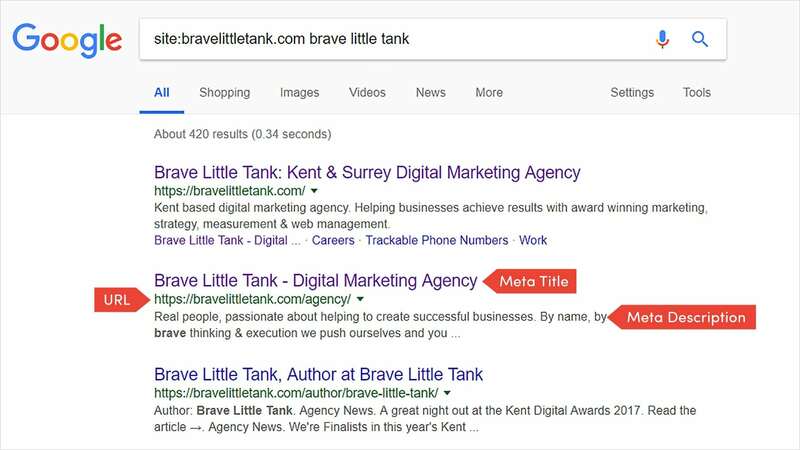 Meta Title – One of the first things users are drawn to in search results are the web page titles, because of their larger size and prominence. Therefore, it’s important to include some keywords in your meta titles for users, but also for search engine robots. Be careful though, users are looking for trustworthy sources and if your page content doesn’t match the title it can be seen as click-bait which may make users wary of your site. Meta Description – The meta description appears below the meta title in search engine results. Searchers will often read the description to confirm that the information is what they’re looking for, and if it is, they are more likely to click through to the page. However, unlike the meta title, the meta description doesn’t affect your page ranking! URL – If the page URL holds keyword phrases that are relevant to the user searches, they will be more interested in clicking the link. This is also useful if a visitor copies and pastes the link for someone, as the URL will given an idea of what’s contained within the content. Headlines – H1 and H2 tags can have an influence if they are relevant to the search query. Image Alt Attribute – Adding keywords to an image’s ‘alt’ attribute not only assists in organic search rankings, but more importantly helps it appear higher in the Google Images results (a 2 for 1 deal!). Google Images recieves a substantial amount of search traffic, an example being shoppers searching for particular products, so it’s best not to forgot this side of the search results. If your website has visitors that stay and progress through different pages rather than immediately clicking the back button, Google sees this as solving the users query and will rank your website higher for relevancy to the search term. When a user searches a query, Google will pick up on any pages in a website that are relevant and connect them to the search. Google essentially associates keywords that are similar, for example a searching for swimming in a certain location may also return results for activity suggestions in nearby locations. Search engine optimisers should be using other words and phrases that Google has related to a particular keyword. Our team has a way with words, so why don’t you enquire about our optimisation services to improve search engine rankings. Call us on 0333 121 2013 or email us at hey@bravelittletank.com.